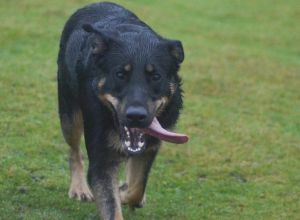 Kenai | German Shepherd Dog in Llantrisant . Kenai is very barky and pulls when hes sees a dog when leashed. It can be mistaken for aggression but hes just excited. Hes very very boisterous and loves to chase other dogs, he tends to scare smaller dogs so hes better suited to large and medium ones.